Congratulations to the winners of the last contest. Kristina A. from Dunedin, FL won A Tale of Two Kitties. Purrder She Wrote goes to Pat P. from Sesser, IL. The books are going out in the mail today. Bones. What would a mystery be without bones? This week, I have two mysteries that have bones in the titles. 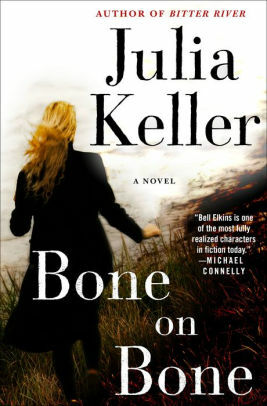 Bone on Bone is Julia Keller's latest book. And, I'll be honest. I hadn't read earlier books in this series, and it really didn't matter. Of course, the series is better if you start at the beginning, but you can still enter and read this one. The book opens three years after the last book Fast Falls the Night. Bell Elkins returns to Acker's Gap, West Virginia. The town may have changed some, but crime and desperation still affects the town. Brent and Linda Topping know that because their world has been upended by the drug addiction of their son, Tyler. Then, Brent is murdered by his son's suppliers. Then, when Linda rushes to help her son, she's shot. Bell and three others try to find the truth about the deaths. 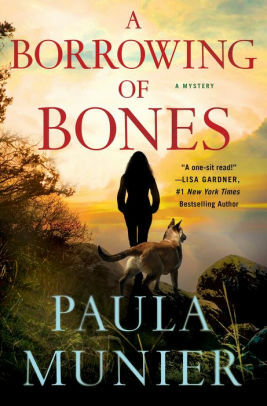 A Borrowing of Bones is the first in a new series by Paula Munier. A retired US Army veteran and her K9 companion Elvis team up with a Game Warden and his search and rescue dog when Mercy and Elvis find a baby and buried bones in the Vermont wilderness. The four work together to track down a missing mother, solve a cold-case murder, and keep citizens of Vermont safe on an incendiary Independence Day weekend. Which bones book would you like to win? You can enter to win both, but I need separate entries. Email me at Lesa.Holstine@gmail.com. Your subject line should read either "Win Bone on Bone" or "Win A Borrowing of Bones." Please include your name and mailing address. The giveaway will end Thursday, Sept. 27 at 5 PM CT. Entries from the U.S. only, please. Oooh, a new Julia Keller! I'll have to look it up. It was the first one I'd ever read, Nann. A Borrowing of Bones is on my library list...I really enjoy all the new K-9 mysteries.